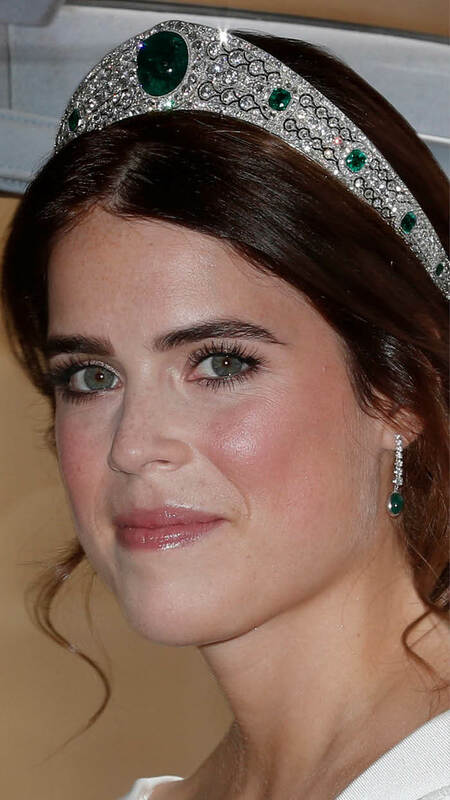 Princess Eugenie is radiant on her wedding day wearing the Greville Emerald tiara. I have to say, that when Princess Eugenie walked down the aisle on Friday 12th October, I think she really looked beautiful- and every inch the Royal princess, probably the moment in her life in which she will have shone the most as a Princess of the Blood of the House of Windsor. As is tradition, the Queen leant her granddaughter a tiara to wear- the first time Princess Eugenie will have worn one, as traditionally, in the UK, unmarried women do not wear tiaras (I don’t know why). The piece she chose was bold, beautiful and surprising. The tiara was made in 1919 by Boucheron for the socialite Mrs. Ronnie Greville. It is composed of rose and brilliant cut diamonds and centrally set with a magnificent cabochon emerald of 93.70 carats. The existence of such a stone is in itself astonishing, as normally coloured stones deemed to be of gem quality are cut into faceted styles in order to maximise their colour and brilliance, so a quality cabochon stone of this size is incredibly rare. The tiara was left to Queen Elizabeth the Queen Mother on Mrs. Greville’s death in 1942, along with a massive treasure trove of other jewels- this became known as the Greville bequest. The jewels that comprised the bequest were so magnificent and remarkable that I will be writing a separate post about this in the near future. As the Greville bequest was a private legacy, it is not known exactly what it contained- and until the emerald and diamond tiara made its appearance last Friday, it was not even known to the general public that this piece was in the possession of the Royal Family, as no member seems to have ever worn it in public. I can’t think why it has remained locked away for nearly 80 years- personally, I think it is an almost perfect piece of jewellery: timeless design, light, flawlessly executed, matchless gems and for a tiara, eminently wearable. This style of tiara is known as a bandeau- which in French, literally means hairband. My suspicion is that Queen Elizabeth II is not a fan of tiaras of this shape (how lucky to have tiaras of different shapes to choose from). The Greville emerald tiara is a very similar shape to the diamond bandeau worn by the Duchess of Sussex on her wedding day, another piece the Queen never seems to have worn. There are also another two bandeau tiaras which have disappeared into the depths of the Buckingham Palace vaults: one is the floral diamond bandeau the Queen was gifted by the Nizam of Hyderabad, which seems to have been broken up. The second, and a historically much more important piece, is the diamond and sapphire bandeau belonging to the Empress Maria Fedorovna. When the Empress died, this piece, along with several others, was acquired by Queen Mary, at full market price as offered by the Empress’ heirs. I am particularly fascinated by this piece, as it was last seen worn by Princess Margaret in the 1960s and find it slightly sad that such a historically important piece should have remained hidden for over 40 years. I am digressing… there is not much point in speculating into who wore what, when and why… the finer intricacies of Royal vaults will remain forever hidden until there is a full blown revolution. But I am delighted that treasures such as the Greville Emerald Tiara reappear into the limelight every now and again- even if it is after 50 years; surely it is better for such jewels to appear now and again as they are meant to be worn rather, than be killed forever behind the anodyne facade of a glass screen? Comparative photographs of Queen Mary, and her granddaughter Princess Margaret, wearing the sapphire bandeau tiara Queen Mary bought from the heirs of Empress Marie Fedorovna.